[User Submitted] Albert and his Hotel Robinson The town of Julian, nestled in the hills of San Diego County in California, was founded in the 1860s by a small group of adventurous men on their way to San Diego, or so the story goes. Soon after its founding, gold was discovered, and Julian became a boomtown. The pinnacle of gold production occurred in the 1870s, and after that Julian started becoming more famous for its delicious apples than its gold. Today visitors can tour an old gold mine, sample the famous apple pie, and then retire to the Julian Hotel for a night with the town\’s resident ghost. In 1897 freed slaves Albert and Margaret Robinson arrived in Julian and quickly made it their home. They bought a building that had previously been used as a bakery and tavern, and turned it into the Hotel Robinson. Many of the townsfolk were still prejudiced against black people when the Robinsons first came to Julian, but with their hard work and dedication the couple eventually won over most of the local residents. The Hotel Robinson was a great success, being a natural stop for people going to or from San Diego. In June of 1915, Albert died and a controversy was astir. Albert’s remaining family, including his wife Maragaret, wanted to bury Albert in the town cemetery. They felt that after his long service to the town such a burial would be deserved. Some of the whites in town felt differently. The cemetery in Julian was “whites only” and eventually it was decided that Albert must be buried in an out of town cemetery “with his own kind”. Thus Albert was delivered a final insult, and it is generally agreed that this is what caused Albert’s spirit to linger on in his old hotel. After Albert died, his wife ran the hotel until she sold it in 1921. Eventually the building fell into the hands of new owners, and was rechristened the Julian Hotel. For years before the new hotel opened, people spoke of a violent haunting in the former Hotel Robinson. There was talk of balls of fire speeding around inside the hotel, glimpsed through the windows. Glass was shattered and pieces of furniture were moved randomly about. Supposedly, an exorcism was eventually performed and the spirit seems to have either left or calmed down, for only old Albert puts his gentle appearances in today. Much of the ghostly activity seems to center around room number 10, Albert’s old room. Strange happenings have often been reported by maids working in the hotel. Freshly made beds unmake themselves, or an impression of someone sitting on the bed is found when no one else was in the room. Albert evidently smoked a pipe, for the smell of pipe smoke is a common occurrence (the hotel is non-smoking). Sightings of pipe smoke and even Albert himself smoking have been reported. In Albert’s room, furniture has moved itself back into its original position after being moved by the owners. Cold spots and slamming doors have also been reported. Windows in the rooms open and close by themselves. Albert must have a playful side, for he is known to hide objects from their owners. Downstairs in the hotel there is activity as well. Some people hear footsteps on the second floor above them when no one else is about. On the stairs the sound of descending footsteps are heard, and some have even seen the shade of Albert passing by the stained glass window adjacent to the stairway. A story has even been told of a menu floating in midair. 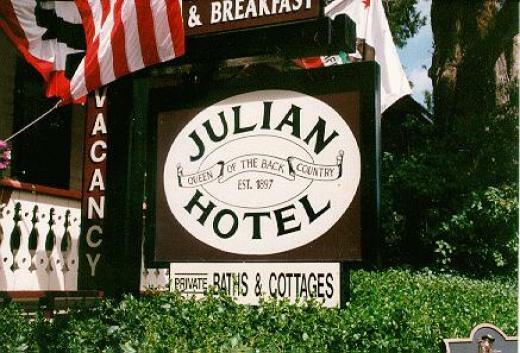 One Response to "The Julian Hotel ghost spirit haunt"
Me and 5 friends are going to have an investigation here next week…a whole night by ourselves!